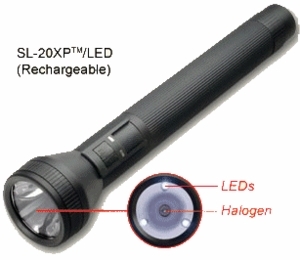 Streamlight�, the only company to offer an LED/incandescent combination in a full-size flashlight, now offers this patented technology in the legendary SL-20XP�/LED rechargeable. This light-weight features a high-output, pre-focused halogen (or xenon) main beam and a trio of close-range LEDs, allowing you to choose a super-bright beam or an incredibly long runtime. Offers a virtually unbreakable polymer construction, a non-slip rubber comfort grip, an unbreakable polycarbonate lens, and dual switch control. Runtime: The battery will support a minimum of 1 hour of LED light after the incandescent (main bulb) runs out. Bulb-life: Even if the main bulb burns out completely, the LEDs have 100,000 hours of life.